Ed Balls believes Birmingham and the West Midlands have been short-changed by Chancellor George Osborne in a Budget which promised better deals for Manchester and Cambridge alone. Labour will devolve any increase in business rates to Birmingham and the Black Country under a deal for the regions, which Shadow Chancellor Ed Balls said “goes way beyond what the Tories are offering”. Mr Balls said Birmingham and the West Midlands had been short-changed by Chancellor George Osborne in a Budget which promised better deals for Manchester and Cambridge alone and pledged to make up for it if Labour formed the next government . He spoke to the Post as he launched Labour’s economic policy and general election poster campaign in Birmingham. Earlier this year, Mr Balls said a Labour government would devolve about £30 billion of centralised spending to the regions, covering business support, apprenticeships and skills, house building and local transport. Expanding further he said Birmingham and the Black Country had every right to be angry over the Coalition Government’s recent devolution deals for Manchester and the ‘Northern Powerhouse’. He said under the Tories only cities and regions which agree to have an elected mayor would be given more funding and freedom. He added: “Birmingham and the West Midlands are being badly short-changed and it’s not good enough. Labour’s going to change that after the general election. “In the Budget, George Osborne said he would allow Manchester and Cambridge to keep any increase in business rates, but why is he excluding Birmingham and the Black Country? George Osborne is saying he will allow Manchester to have more powers but he’s excluding Birmingham because Birmingham has not signed up to an elected mayor. He said that since Birmingham and many other cities had rejected elected mayors in the 2012 referendum a Labour Government would not impose one. That remains a decision for the local people. But, he said they would view favourably those councils which worked together in combined authorities and gave his backing to moves towards that in the West Midlands. 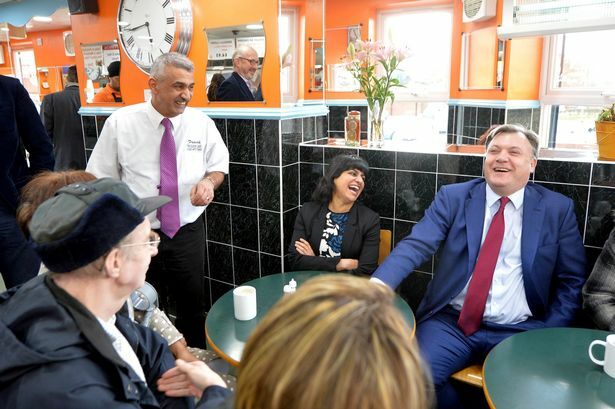 Mr Balls visited the Clock Cafe in Northfield where he politely declined a bacon sandwich – rather than risk a repeat of the embarrassing photographs which have dogged Ed Miliband. A sandwich was later supplied to enjoy in the privacy of his car. On the NHS funding, which was also recently devolved to Manchester, he said Labour would encourage more cooperation between councils and health services – to deliver cost effective integration between social care and health care. Last month Prime Minister David Cameron told the Post his Government did not regard Birmingham as a ‘second class city’. “We recognise Birmingham’s status as Britain’s second city as a powerhouse and it will get the attention it deserves,” he said.